The Organization for Economic Cooperation today downgraded their expectations for U.S. economy expansion in 2016 from 2.0% to 1.8% and the Institute for Supply Management released their Manufacturing Purchasing Managers Index Report, which showed a surprising gain of .8% instead of an anticipated loss. Still to come this week are the consumer confidence report, jobless claims report, personal income and spending report, ADP private job sector report, and the U.S. non-farm payroll report. 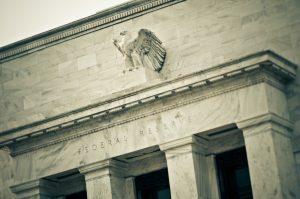 Positive information from the weeks remaining schedule of reports will add momentum to the Feds desire to increase interest rates by another .25% after the June FOMC meeting. However, even with a string of positive reports, which would indicate that the economy and Dollar are recovering, the 800-pound gorilla in the room remains the Brexit vote, scheduled for still later in the month. The Fed is definitely felling the need for speed, but I think they’ll really be jumping the gun if they decide on an interest rate increase this month instead of next. In addition to the Brexit vote, whose result currently appears to be a flip of the coin, there are a number of global conditions giving reason for caution. China, for example, shows an economic growth rate of 6.8%, continues to hoard gold, and continues to petition the global community to replace the U.S. Dollar as the lead Global Reserve Currency. Through all of this, the U.S. currency, economy, and stock market remain in potential peril. And China’s continued stockpiling of gold should send a clear message to every investor, that a potential collapse is possible, as well as potentially being sudden and massive. A shift away from nothing but paper assets is probably not only advisable, but more than economical at current rates. It’s quite possible that a Safe Haven has never been so highly desirable, advisable and economical.